Growing up, I would hear people quote this statistic: “Eskimos have more than a hundred words for snow.” Actually, I still hear people rattle off this little ‘fact’, especially in winter. However, there are a lot of problems with this statement, not even including the fact that the indigenous people of North America’s tundra and Arctic regions are known as Inuit, not Eskimo. No, what really grates on me about this blanket statement is the implication that it’s somehow weird to have so many words to describe one thing. When it’s something that makes up a very large part of your daily life during a significant portion of the year, why wouldn’t you take the time to describe it as accurately as possible? The English language has several words for rain: showers, downpour, drizzle, sheets, so why not snow, especially in light of the fact that it sticks around a lot longer than its warm weather counterpart. Actually, as a Canadian, I’m surprised that we, as a population, haven’t developed more words beyond flurries, blizzard and slush to describe this white stuff that blankets much of the country for four to six months out of the year. To do that, we have to turn to other cultures and languages. While the true count is well under one hundred, many Inuit dialects have several useful words to describe the incredible variety of snow that we can encounter throughout the course of the winter. For those of us who live in forested areas, one handy word to know is qali. It refers to the snow that builds up on the branches of trees, glazing limbs in white and making it look like someone attacked the woods with a decorator’s bag full of royal icing. I was lucky to have learned several Inuit terms for snow as part of some of my undergraduate university courses and like many people who study winter ecology, they’ve been part of my lexicon ever since. So, it took a bit of digging to figure out where the word qali comes from. According to William Wonders, who wrote the book Canada’s Changing North (2003), the word originates from the Kobuk Valley Inuit of northwestern Alaska, along the edge of the treeline. Qali can range in thickness from a light dusting that could almost be mistaken for hoar frost to heavy globs of wet snow that drag beleaguered limbs to the ground under its unrelenting weight. All along that spectrum, it has a significant impact on the ecological community. Many winter residents are affected by qali. Spruce grouse and squirrels that regularly feed on cones often find themselves driven down to the ground by a particularly heavy layer of qali. The snow-covered branches can be hard to navigate, forcing these species to search elsewhere for food. On the other hand, qali can make some food more accessible. With particularly heavy wet snows, the qali that builds up on young birches, willow and aspen pulls the flexible branches down, bringing the young, tender tips within reach of hungry cottontails and snowshoe hare. These contorted trees may also provide shelter for a whole host of wildlife. You might not have ever realized it, but if you live in an area that experiences snow, qali has likely affected you at some point and I don’t mean that moment when you accidentally brush up against a laden branch and send an unwanted shock of snow pouring down the collar of your coat. I’m talking about more significant impacts. Qali can be very heavy and often trees buckle under the weight taking down whatever else is nearby, which is some cases are power lines. I know I’ve spent the odd cold, snowy night in the dark, waiting for hydro to be restored. These qali-broken trees also open up the forest floor to new growth, creating pockets of mini forest succession and driving the forest cycle on a smaller scale. Snow is an amazing thing and qali is only one small facet in a dizzying array of diversity, which thanks to northern cultures, we’re able to describe in accurate and imaginative ways. So, next time you take a winter walk surrounded by white, take a moment and discover that variety for yourself and maybe even create your own words to describe it. The first blush of spring flowers has long since faded, leaving forests and fields to settle into the rich greens and sunny yellows of mid-summer. Still, the decidedly verdant palette is broken now and then by a showy splash of pink, startling against the endless green, like flame in the darkness. These tall, fuschia spires are fireweed, nature’s phoenix, rising out of the ashes of destruction and bringing colour back to the land. They also happen to be one of my favourite flowers; but not for a reason that’s immediately obvious. They’re actually rather tasty. Nearly 15 years ago, I was fortunate to spend some time visiting a friend in the Yukon. We had an amazing time exploring the western edge of the territory, camping out in the shadow of the Rockies in the still long days of early fall. In the airport on the way home, I spotted it, jars of a clear pink, gleaming in the fluorescent light of the gift shop: fireweed jelly. I had to try it and after tasting its delicate, sweet flavour, I had to figure out how to make it. Turns out, the second part of that equation was harder than I expected it to be. Over 10 years ago, the internet was not as vast and I couldn’t find a recipe anywhere. After much searching, I ended up finding what I needed in a dusty old text squirrelled away in the Winnipeg public library. I actually found a lot of ways to cook wild edibles in that book; but most coveted was my recipe that will work for any petal-based jelly. We’ve been blessed with an abundance of fireweed this summer in Grindstone; but I’ve been so busy with other work that I haven’t had time to go out and harvest. It’s fairly time-consuming labour. Picking the flowers is easy enough. You just need a pair of scissors, long pants and something to store the feathery spikes in. Once you get them home, the fun part starts: separating the blossoms from the stem. I usually end up spending a good hour plucking the flowers, one by one, dropping them into a bowl and setting the green bits (which are also edible) aside. By the end, your fingers will be died purple and the rest of you will be crawling with crab spiders and leaf hoppers; but it will be worth it in the end, trust me. Once you have your blossoms, stuff as many as you can into a pint sealer jar and cover the lot with boiling water. Let the developing tea steep for 24 hours in a dark space (to keep the sunlight from washing out the delicate colour). Strain out the now leeched-white blossoms and pour the liquid into a deep pot, adding 1 1/2 cups of sugar for every cup of tea (3 cups to a pint). Add a teaspoon of lemon juice and bring to a rolling boil, letting it go for a good minute. Add 6 oz of liquid pectic to the mix and boil hard for another minute or so. Take it off the heat and skim any foam before carefully filling sealer jars and proceed to can it according to direction. This recipe doesn’t make much, but it’s flavour is worth it. If you’re concerned about the colour once you’ve strained out the blossoms (sometimes it can look a little brownish), you can add a tablespoon or so of strawberry juice. It won’t affect the taste, but will keep it nice and pink. 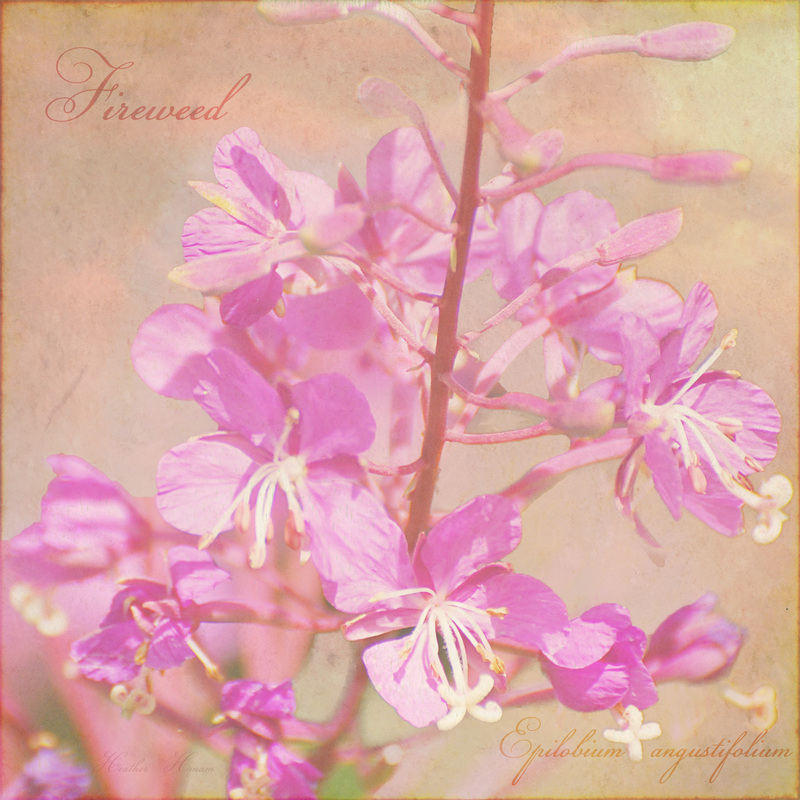 Fireweed is one of those flowers that just seems designed to bring joy wherever it grows. As suggested by its name, its rhizomic habit makes them one of the first colonizers to bring colour back to a fire-blackened forest, springing up through the ash from runners in the underlying soil. This year, the bright blossoms brought beauty back to the devastation wrought by Manitoba Hydro after they cleared the area around their power lines of shrubs and trees in my area. As my friend, Cindy mentions in her recent post on the same subject, thanks to their tenacious rhizomes that can knit their way through the soil up to almost half a metre deep, fireweed managed to find its way into the centre of London after the city was ruined in places by World War II bombs. To me this hardy denizen of northern forests and fields is a reminder to all of us that even in the face of humanity at its ugliest and most destructive, nature always manages to find a way to bring light back to the earth. Some childhood memories just seem to stick with you, lodging in your grey matter and coming back to haunt you at random intervals. One that has been showing up quite frequently on the mental playlist lately harkens all the way back to a stint at Girl Guide Camp at Bird’s Hill Park, just northeast of Winnipeg over 20 years ago. It was a dark and muggy mid-June night as we trucked off as a group of giggling girls to the public washrooms. In the orange haze of the sodium lights, we heard a shriek of fright and immediately thought a bear had found its way into the campsite. Nervous, we crept around the corner toward the source of the sound and found girls from another troupe cowering under the lights over the door, pointing to the wall. The source of their terror? 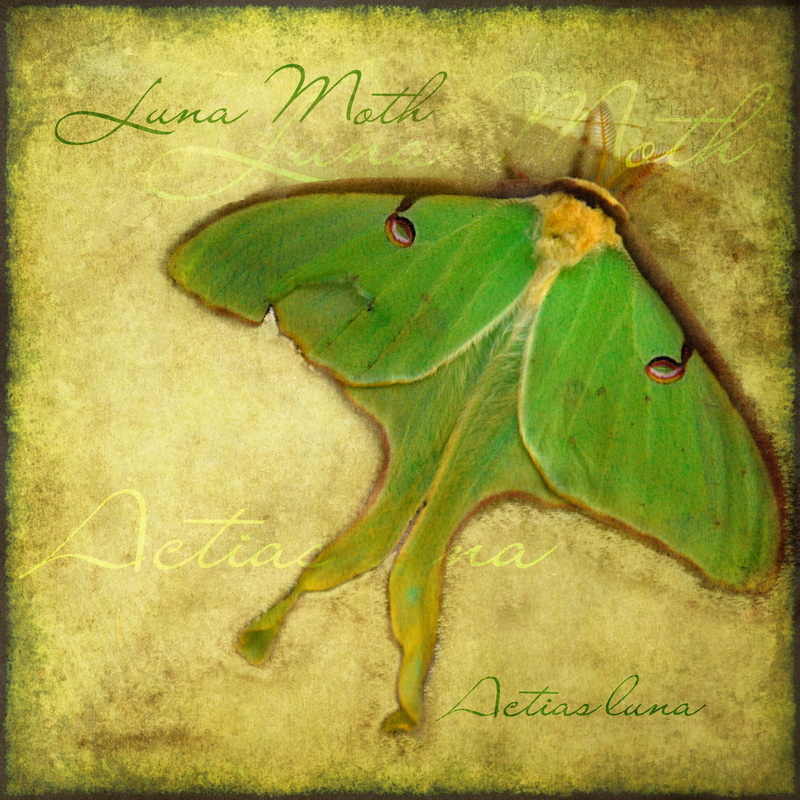 Luna moths. Looking back, I can see how these fluttering, green giants could scare the bejeepers out of a bunch of city girls. However, I was more fascinated than frightened by these enormous moths; still am. I went a couple decades without seeing them again until one June day a few years ago. A friend came into work at the resort on Hecla Island and announced that they had a giant green moth on their door screen. Needless to say, I was over there with the camera in short order. The image above was the result. There’s just something compelling about these ghostly green insects that float, like the moonbeams their named for, through the early summer nights. With a wingspan of about 4 inches, they’re one of the largest moths in Canada and arguably one of the most beautiful; but few people get the chance to see them. They’re nocturnal and only exist in their adult form for about a week, so to catch a glimpse of these beauties, timing is truly everything. They actually have a lot in common with a much more abundant and much less revered insect that emerges a few weeks later here in the north woods, namely the fishfly. Like its very distant cousin, adult luna moths have one purpose: to mate and deposit eggs to ensure the next generation. Like fishflies, these Saturnid moths have no mouths and do not feed. Their large, fuzzy bodies and consequently larger energy reserves from their larval stage allow them to live longer than the fragile fishfly. In the dark labyrinth of the nighttime forest, finding a suitable mate is hard work, so male lunas can travel kilometres, tasting the air with their antennae for the pheromones drifting from a ‘wick’ extending from the abdomen of a waiting female. Because they’re needed for this function, the antennae of male luna moths are much larger and fluffier than those of females, making the sexes fairly easy to tell apart. The moth pictured above is a female. Once the sexes find each other, they lock together in copulation for up to 20 hours before she sets off to lay her eggs. A female can produce up to 300 eggs, scattering them around the forest, a half dozen or so at a time, on the underside of birch leaves to incubate for almost two weeks. The larvae are just as impressive as the adults, a bright, almost fluorescent green caterpillar that you can find trundling along the trunks and branches of its host plant, munching away on the leaves and growing up to 4 inches long by the time it sheds its exoskeleton for the fifth time (a process known as ecdysis). Up here in Manitoba, where the summers are not long enough to allow for two generations, lunas overwinter as pupae in their cocoons. It isn’t until the following June that they will emerge from this stasis, all crumpled and fragile. Slowly, over at least half an hour, the new moth will pump hemolymph (insect blood) into their wings, ‘blowing them up’ until they harden into their characteristic green sails. It’s an event you can witness first-hand if you’re lucky enough to find a caterpillar before it pupates and keep it at home over winter. I’m actually planning to try and do just that later this summer so that I won’t miss the emergence of one of my favourite denizens of the dark. After charging out of the gate early and then several false starts later, spring is finally settling in here in the boreal forest. It’s been a strange year so far and I can’t help but wonder worriedly at the changes I’ve been seeing in the climate these last several years. Between summer-like temperatures, then snow and frost, it’s been hard to get true sense of the seasons. The animals, however, tell a different story. Seasonal behaviour in most species is hard-wired to a certain degree, often tied in less to temperature and more to changes in the length of daylight. While, unseasonably warm or cold days can either speed up or slow down nature’s clock, the overall pattern remains relatively constant. For me, one of the first harbingers of spring comes in the form of a frantic ball of red fur streaking through the forest. Red squirrels (Tamiascurius hudsonicus) are active all year, racing from tree to tree, industriously gathering up anything remotely edible and either devouring it on the spot or stuffing it away in a midden, the heart of their territory, for leaner times. This flurry of activity takes a definite upturn as the darkness of winter gives way into the softer, longer light of spring. Here in the boreal, that can be as early as the beginning of March, when patches of snow-free ground begin to appear on the forest floor. Females are only reproductively receptive for a day, but she’s not shy in giving her potential suitors a head’s up, bounding through their territories, days before her estrous, reminding them of their impending opportunity. 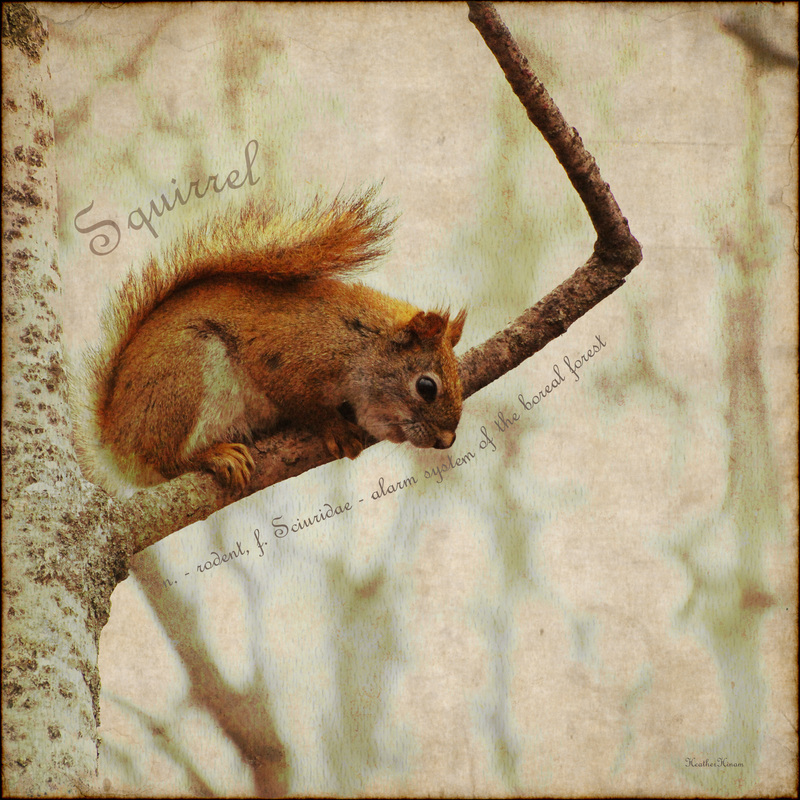 Squirrels aren’t known for their social grace or a warm and welcoming demeanor. These feisty little rodents are fiercely territorial, expressing their displeasure at anyone and anything that crosses into their domain with an insistent rattle that ricochets off the surrounding trees like a miniature jackhammer. Mating season is the only time of year that edginess eases somewhat and males welcome the presence of female intruders into their little patch of forest, hoping for a chance to pass on their genes. However, if another male crosses over the boundary, all bets are off and the territory holder immediately lays into the interloper, the two of them bounding through the forest in a flurry of fur and furious chattering. Females are equally antisocial and once the deed is done and she’s been inseminated, the donor is no longer welcome on her doorstep. Like many mammals, red squirrel females raise their young on their own, tucking themselves away into an old woodpecker hole to set-up a home for their young. Gestation is only a little over a month, so it won’t be long before the squirrels in my neighbourhood find themselves with new mouths to feed. The young are born blind and pink, completely dependent on their mother’s milk and warmth, tucked up in the whorls of grass with which she’s lined their nest. Nests are established opportunistically, and squirrels will just as easily set up house in a nest box intended for birds as in a natural cavity. In my years working with saw-whet owls, I’ve stuck my hand into my fair share of squirrel’s nests and come out with a palm full of very warm, very naked little babies. They grow quickly, however, putting on almost 2g/day until they’re ready to venture out on their own just over four months later. By that time, the little guys are fully furred, smaller replicas of their parents, with an innate ability to scamper through the trees without a second thought. That’s not to say there isn’t a bit of a learning curve. One can only marvel at their resilience when watching a juvenile plunge 40 ft out of the tree to the ground, dust himself off and climb right back up like it was nothing more and a stubbed toe. Resilience is key if you’re a red squirrel. Once they leave the nest, times are tough. By the end of the summer, they are no longer welcome on their mother’s territory and must take up residence someplace else. Competition is fierce and predators, like marten, goshawks and owls are just waiting to make a meal of them. Still, squirrels are scrappers and if they can get a foothold in that first year of life, they’ll likely be just fine. So, spring settles in with fits and starts after an unnervingly warm winter, I can’t help but take comfort in the ringing rattle outside my window, reminding me that even with all that is changing around me, the seasons still cycle and life finds a way to move ever forward. As I’ve mentioned before, I have always had a love for obscure words, especially those that find everyday use in the lexicon of certain specialties. Crespuscular is one of those words. I use it all the time, but it’s definitely not common knowledge, something that’s become increasingly obvious over the many years that I’ve been a nature interpreter. I’ll throw it out there, along with other natural history terms, like ‘nocturnal’ or ‘carnivore’. While my charges usually nod sagely in understanding at these other adjectives, ‘crespuscular’ usually elicits furrowed brows and working tongues as they try to wrap their mouths around the syllables, eyes rolled up towards their brains, as though watching it try to divine the word’s meaning. It’s too bad, because it’s a good word. It’s also a great way to be. 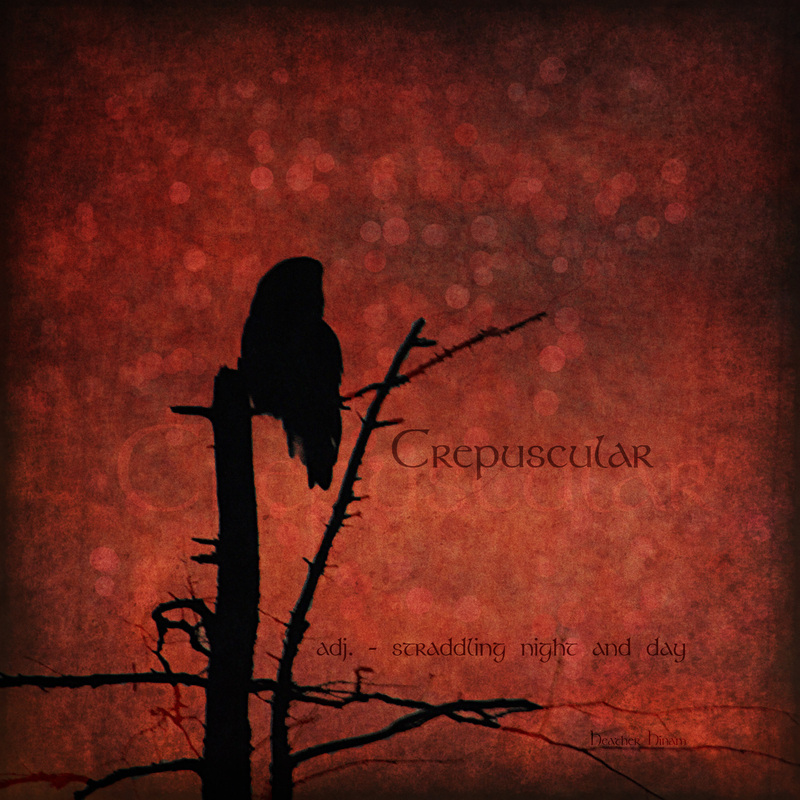 A crepuscular animal is one that is most active at twilight, straddling the line between night and day in the muted light of either dawn or dusk. It certainly my favourite time to be out and about, probably because I’m in such good company. Many animals are crepuscular in their habits; the most notable of which, for me, are the owls. Species, like the Great Gray Owl, are at their best at this hazy time of day, making use of their enormous eyes and highly-tuned hearing to pick up the slightest rustle of prey along the forest floor. Owls, however, are not the only birds that enjoy this shoulder time. Common Nighthawks and Wilson Snipe also come alive in the dusk, the former swooping and diving through the gloom, scooping up millions of flying insects that have taken to the air after the heat of the day before the cool night temperatures slows their metabolisms and forces them back to earth. Most songbirds reserve their choruses for the crepuscular hours; Olive-sided Flycatchers announcing the dawn and Hermit Thrushes heralding the dusk, their refrains rounded out by the harmonies of breeding frogs. Most boreal mammals are also crepuscular in their habits. 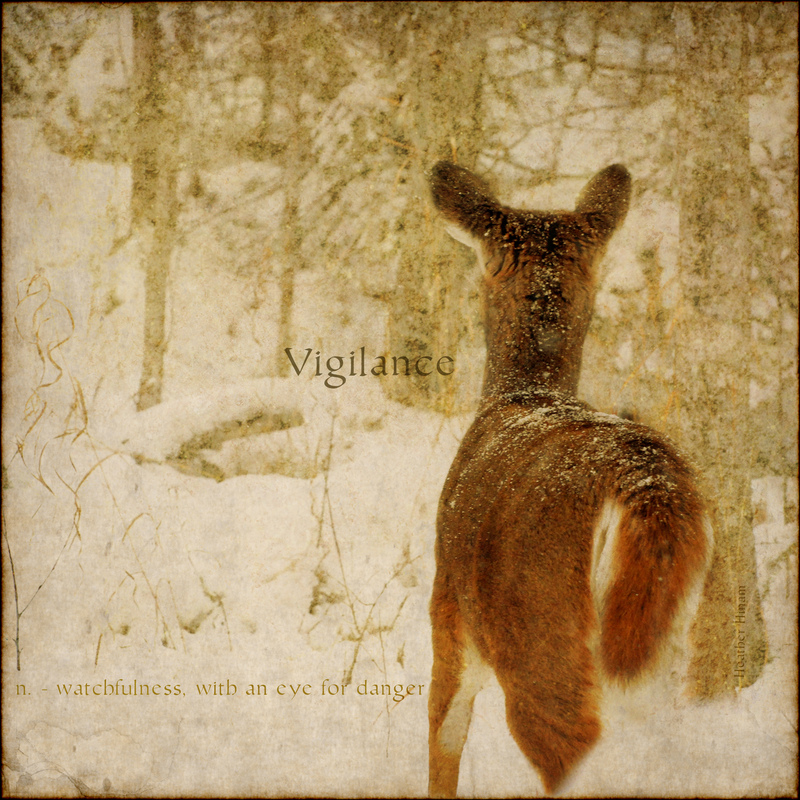 The dull grey winter coat of the white-tailed deer is at its most invisible in the murky hours of twilight, especially to the mostly colour-blind vision of their carnivorous predators. Bats join the nighthawks in their aerial quest for a meal and rabbits emerge from the shadows, taking advantage of the low light to grab a quick nibble before complete darkness makes it difficult to spot approaching danger. In reality, the busiest time of day, in whatever habitat you might live, is twilight. So, whether you are an early bird, who rises before the dawn, or a night owl, like me, who takes comfort in the release of the day as the sun slips below the horizon, get outside at these tenuous moments and discover the beauty and wonder of becoming crepuscular in your habits. No matter how hard we cling to the long light, crisp mornings and golden trees, fall, like all good things, must eventually come to an end. Autumn is gasping its last breaths here in the boreal forest as the cold November winds sweep away the last of the colour and hard frosts condition us for the deep freeze to come. Our last blaze of glory before the forests fade to the dull greys and bleached greens of winter comes from an unlikely source, a tree that should be an evergreen. 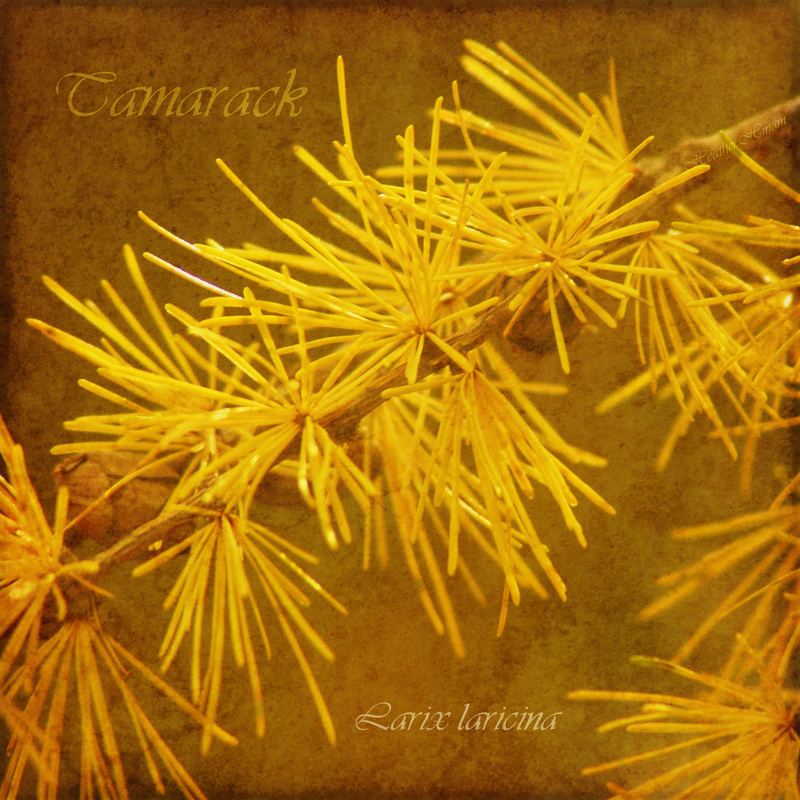 I’m talking about the Tamarack (Larix laricina). Also known as larches, tamaracks are conifers, needle-bearing trees; but unlike their boreal forest brethren, they are one of the only North American evergreens that don’t remain ‘ever-green’. Tamaracks are deciduous conifers, a beautiful paradox that bring one last flash of light to the forest before it’s extinguished by the wind scattering their needles all over the ground like a Christmas tree in January. So, why do they do it? Did larches miss the ‘conifers are evergreens’ memo? The jury seems to still be deliberating on the evolutionary history, costs and benefits of this strategy, but when you take a step back and think about it, larches are taking advantage of the best of both worlds. Broadleaf trees, like aspen and birch, create leaves that are relatively cheap to produce, with a large surface area-to-volume ratio that makes them high-efficiency photosynthetic factories. Unfortunately, that large surface area also makes them incapable of handling wild swings in temperature and moisture. So, deciduous trees cut their losses and lose their leaves when conditions no longer favour them. Conifers take a different approach. Their needles are built to last, their low surface area-to-volume ratio and waxy covering make them much more resistant to temperature and moisture extremes. This allows the tree to keep them all year, which is necessary, because they don’t produce nearly as much energy through photosynthesis as their deciduous counterparts. Tamaracks straddle the fence. Their needles are soft and long, with thinner cuticles and a little more surface area. This allows them to make the most of the summer sun and produce as much food as possible through photosynthesis, while protecting them from the wild swings in temperature and moisture typical of the northern boreal forests. Having needles also makes it possible to extend their season, turning sunlight into food right through to the end of October. Then, when the frosts set in and snow is in the clouds, the photosynthetic pigments shut down, leaving the needles a brilliant gold before they flutter to the ground. Without the added strain of maintaining their needles, the tree can survive harsh winters that can sometimes damage other conifers. This strategy has allowed tamaracks to survive and even thrive in some pretty difficult habitats, from the edge of the Arctic treeline to the waterlogged and acidic soils of bogs. As a field biologist, I’ve had sort of a love-hate relationship with tamarack. Whenever I spotted a stand of these trees towering in the distance along my survey line, I knew that I would soon find myself up to my knees in water and would spend the rest of the day trying to dry out my boots. Then, I would find myself in their midst, their soft, feathery limbs brushing me as I passed as though welcoming me into their world. Now, it’s a world a return to visit as often as I can.